As I mentioned in this article, God has really been speaking to me about fitness. He has been asking me to allow Him into this area of my life more than I ever have before so He can bring freedom to me and many other women. If you are anything like me when you think of the word "fitness" an image of a ripped bikini model comes to mind and I automatically dismiss myself from being fit. With that mindset comes two extremes. The first extreme is the myth that if we can't look like that bikini model, why even try to take care of ourselves? With that comes laziness, poor hygiene, sickness and so much more. The other extreme "rises to the challenge" to look like the bikini model and says "I will do whatever it takes to look like that, even if it means sacrificing time, kids, health, money, etc". The common factor in both extremes is that we are not honoring God with our bodies. If you are like me you are also thinking "so is it wrong to aspire to have a ripped, lean body?" When I asked God that question he gave me the illustration of a millionaire being interviewed on how he got wealthy. If that millionaire takes all the credit for earning his wealth in his own power than he is blinded by pride. The same principle applies to our bodies. If we use God's principles to be healthy and look fit yet take the credit for it like we did it ourselves then we may be blinded by pride as well. 1 Corinithians 6:19-20 tell us "Do you not know that your bodies are temples of the Holy Spirit, who is in you, whom you have received from God? You are not your own; you were bought at a price. Therefore honor God with your bodies." Romans 12:1 also says "And so, dear brothers and sisters, I plead with you to give your bodies to God because of all he has done for you. Let them be a living and holy sacrifice-the kind he will find acceptable. This is truly the way to worship him." There is no arguing the fact that God desires for us to honor Him with our bodies, not ourselves. It sounds simple yet we make it so complex. So I began to ask God how to honor Him with my body and he brought me back to the verse in which this blog was founded upon, 2 Timothy 1:7. 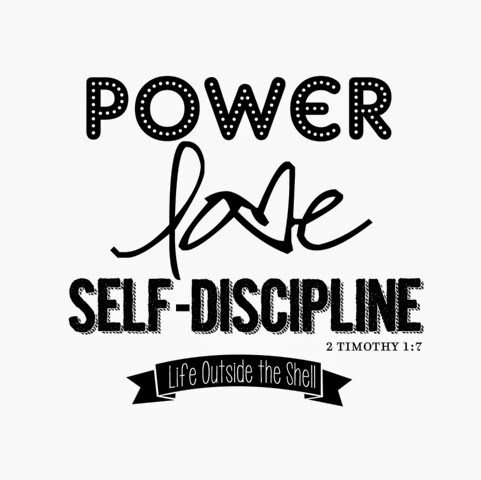 "For God has not give you a spirit of fear or timidity, but power, love and a self discipline(or sound mind)." This element is the fitness component. When you think power in this area think of moving. Step away from all the FAD workouts for a moment and ask God how he created YOU to move. Do you enjoy running, walking, swimming, dancing, lifting weights, competing in races, rollerblading? What is it that connects YOU to HIM? Get moving not in your own power, but in the power He has put within you. Pray before you exercise. Ask God to join you on your exercise. If you can't find God in exercise than you may need to reevaluate if the activities you are participating in are from Him. This is where we connect to God through reading His word and praying. I don't care how many minutes you pray or how many chapters(or verses) you read. Just connect to Him on some level. This is an element of wellness that so many fitness professionals overlook and I am on a mission to bring it to life again. 3. SELF-DISCIPLINE(also translated SOUND MIND). This involves us eating healthy, whole foods. I am not interested in counting calories or weighing food here. I want us to connect to the one who made us and ask Him what foods line up with our body. Focus on eating whole, unprocessed foods. Pray before you meal plan and before you eat. I believe the Lord is going to reveal lies we have believed in regards to food and our bodies. Food is our friend and can be used to bring life into our bodies if we make wise food decisions. Ask God if you have made an idol of food then allow him into that area of your life to bring freedom. The Facebook group will not be a place to sell a product or service but instead will be used to post healthy recipes, fitness tips(and videos) and encouraging words from the Bible. I hope you will join us!